Monday, after I updated the blog, the container that we'll be sharing with EBEX (who still have stuff left over from their recovery last year) was moved over next to the SuperTIGER shipping containers behind the Science Support Center (SSC). Sean, Thomas, and I re-arranged things between the containers, so most of the stuff that we have down here that we'll ship back is in the shared container, the container that will be staying here for CSBF storage has all the stuff that stays on the ice, and our other container was empty, so that we can fill it up with the recovered SuperTIGER instrument. While we were packing, James came by and told us that the SuperGroom Team (James, the camp supervisor; Lyra, the mountaineer; Dave, the mechanic; and Thomas, from the SuperTIGER science team) flight out to Thomas Hills was not the backup mission for Tuesday but the primary mission for Wednesday. This was good news, since it meant that the SuperGroom Team might get out before the 2-day no-fly break for Christmas. Tuesday morning, I woke up and had breakfast with Thomas and a few other scientists that were waiting for flights out, mostly to WAIS Divide, where the SuperGroom Team and Tiger Tails (Sean, Dana, and I) were supposed to go in some of the previous iterations of the plan. After breakfast, Thomas had some errands to run just in case the Thomas Hills SuperGroom Team flight went out on Wednesday. We had all planned to volunteer in the kitchen, so we basically just walked in and talked to them. There was stuff to do right away, so I got to work. My first task was peeling and chopping the ends off of 40kg of carrots that had just arrived the night before from New Zealand. While I was about a third of the way through, Sean showed up and was given 70kg of fresh potatoes to slice. We talked with people that worked in the kitchen for a while while we worked. After finishing the carrots, I cleaned 7 boxes of bell peppers. Just after I started, Thomas came by to help and was put to work in the bakery making cookies and biscotti. By the time I finished all 7 boxes of peppers, it was lunch time, and since I'd been working for 4 hours in the kitchen I was sent home and given a cool hat to thank me for my help. 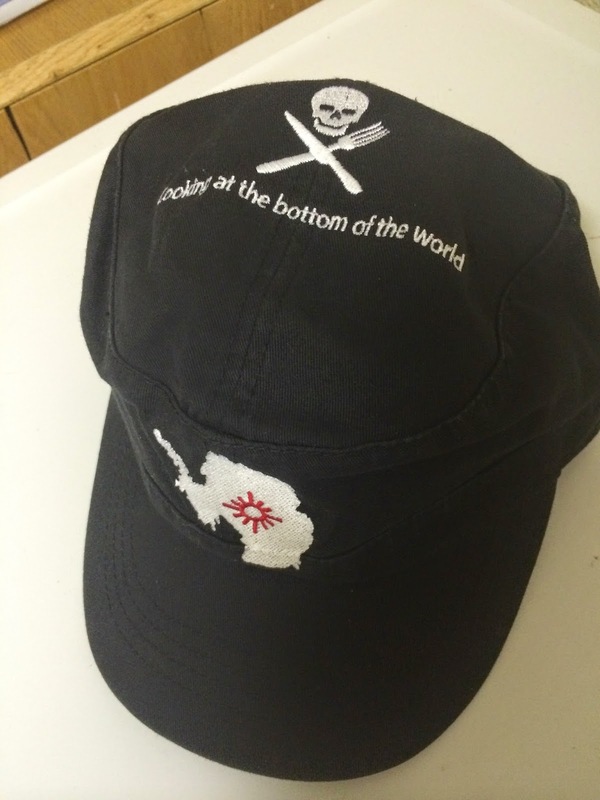 The really cool hat I got for volunteering in the kitchen. In the afternoon I worked in our cubicle for a while, and then met up with Thomas and Sean for dinner. Thomas had to Bag Drag at 7pm, so he went and did that while Sean and I went to the store. It was Sean's birthday, so we hung out in my dorm for a while Tuesday night. Wednesday morning COSI had another potential launch opportunity, but they ended up having to cancel because of wind. I had breakfast with Thomas and then got the Tiger Tail iridium satellite phone and SuperTIGER team pager from him. I went back to my room for a little bit before going up to the Movement Control Center (MCC) where the SuperGroom team was meeting to be driven to the airport. 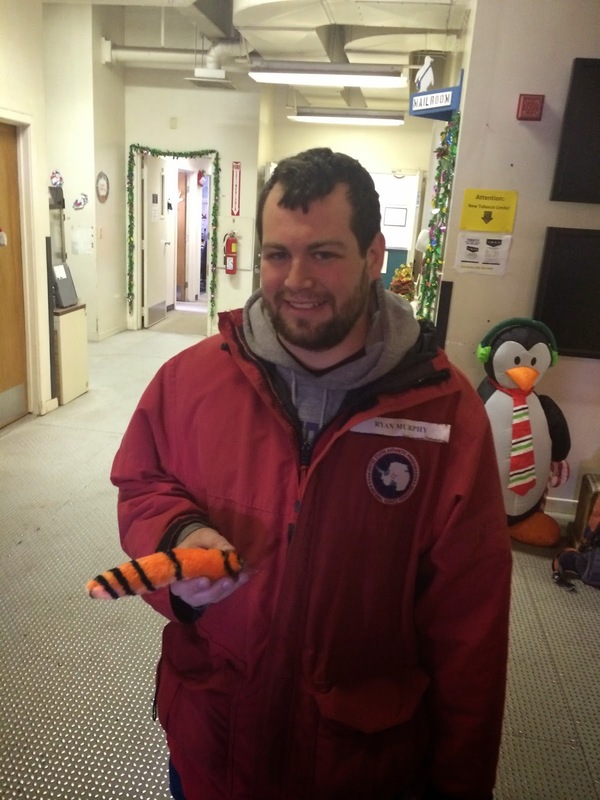 There, I said goodbye to the SuperGroom team and took possession of the official Tiger Tail mascot: a stuffed tiger tail on a suction cup that Ryan, our science implementer, had given James. The SuperGroom team has a matching set of Tiger ears. I got to the MCC just before James, and the SuperGroom team was quickly shuffled out the door because the Air National Guard wanted to move up the flight. For some reason, Thomas insisted that we take a photo of me with the Tiger Tail instead of a group photo of the SuperGroom team before they left. The SuperGroom flight to Thomas Hills was originally scheduled for 10am, but they ended up taking off at 9:15. They got to Thomas Hills around 1:15pm, and the Herc left there at 2 for the South Pole, where it refueled and came back to McMurdo. The SuperGroom team will stay at Thomas Hills until a Kenn Borek Air de Havilland DHC-6 Twin Otter flies up from the South Pole and takes them to SuperTIGER site. Thomas Hills is a camp that currently is home to four members of the G-297 science team, led by Trevor Williams, who has been tweeting updates and photos. The Tiger Tails will then follow the SuperGroom team to the SuperTIGER site, once a skiway for the Basler (a modified DC-3 airframe) has been groomed. The Tiger Tails will be flying through the South Pole on the way down, and on the way back we'll either go through WAIS Divide or the Pole. Back in McMurdo, I worked out of the cubicle for most of the day. After lunch, I called home and talked to my extended family, and then Sean and I went to the McMurdo General Hospital. The South Pole is at 9,300 ft (2835 meters) elevation, but the effective elevation because of the air pressure is often higher. Medical in McMurdo has a supply of Diamox, a drug that prevents Acute Mountain Sickness, so we wanted to get a supply before we went down to the Pole just in case. After dinner, Sean went to a movie night at the coffee house, and I went over to the McMurdo Christmas party in the Vehicle Maintenance Facility (VMF). It was pretty fun, and a kind of surreal mix of traditional christmas--photos with Santa in his "sleigh" (a Piston Bully), photos with the Grinch for those who wanted them, the McMurdo community choir singing christmas songs--and a dance party (this is probably the only part I've ever been at where Christmas songs have been followed immediately by Chumbawumba). The Tiger Tails aren't on the scheduled Saturday flight to the South Pole, but we'll probably leave sometime early next week, "weather and logistics permitting".